Two short sagas deal with the legendary discovery of America by Vikings – the Saga of the Greenlanders (Grœnlendinga saga) and the Saga of Eirik the Red (Eiríks saga rauða). To be honest, neither of them seem to me to have much literary merit and to be mainly of historical interest (which is considerable). The revelation for me is that there wasn’t one big voyage but quite a few trips stretched over a number of years and by a cast of people each discovering different parts and having different adventures. Thus there isn’t the continuity of characterisation you get in even the fairly short Þattrs. Scholars take this patchiness to prove them closer to the original oral tradition, with less literary ‘shaping’ of the narrative than we see in most other sagas. That said, the anecdotes in Grœnlendinga saga are threaded together by being associated with successive children of Eirik the Red; and an over-pattern of sorts emerges in the contrast between Freydis the psychopath and Gudrun the saint, though only really in the last chapter. 1 – A man named Bjarni Herjolfsson arrives one summer in Iceland to find his father has emigrated to Greenland along with Eirik the Red, so he sets off to follow him. Three days from Iceland they lose their way. Over the weeks he and his crew spot three distinct lands but, since none of them tally with the description of Greenland he doesn’t go ashore. Eventually the wind does blow them back to Greenland where they land and find his father’s farm, settling there. People hear of his travels and criticise him for lack of curiosity in not landing anywhere. 2 – Leif the son of the outlaw Eirik the Red, is interested in Bjarni’s discoveries, buys a ship from him, hires a crew and tries to get Eirik to lead the expedition but Eirik says he is too old. They discover the same lands as Bjarni but in reverse order and name them: Helluland (meaning Stone-slab land), Markland (meaning Wood land) and a much more fertile place they decide to stay for the winter: cattle could graze here all year round, the sun doesn’t disappear in winter, the salmon are huge etc. They build a base and explore. 4 – Thorvald Eiriksson, Leif’s brother, thinks that Vinland was not explored enough. He takes Leif’s ship, sails across the sea, finds Leif’s camp and stays the winter surviving on fish. In the spring the explore further west, finding one grain cover but nothing else human. Next summer Thorvald explores to the east and north, discovering some boats made of skin and people hiding under them, who they proceed to murder (!) The natives, called Skraelings by the Norsemen, return and attack en masse. The Vikings sail off in a defended boat but Thorvald is fatally wounded, dies and is buried in Vinland. His crew return to Greenland. 5 – Thorstein Eriksson goes to Vinland to recover the body of his brother, in the same well-travelled ship, taking his wife Gudrid. The expedition never reaches Vinland, after sailing all summer ends up back at the coast of Greenland, where Thorstein falls ill and dies. Supernatural events occur: The wife of their host Thorstein the Black dies but sits up and talks. Then dead Thorstein speaks out of his dead body and tells the fortune of his wife Gudrid, predicting a long and prosperous life for her back in Iceland, and a pilgrimage to Rome. 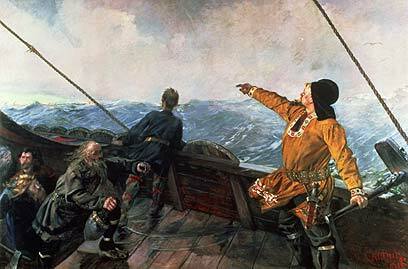 6 – A ship arrives in Greenland from Norway commanded by Thorfinn Karlsefni, a rich man. He falls in love with Gudrid and they marry (her third marriage) and he’s encouraged to lead an expedition to Vinland. The expedition arrives in Leif’s and Thorvald’s old camp and stays there for the winter. Next summer a group of natives or Skraelings come visiting, carrying skins for trade. Karlsefni forbids his men to trade weapons, instead selling them dairy products. —Gudrid gives birth to a boy, Snorri, the first European born in North America.— The second winter the Skraelings come again to trade but this time one of Karlsefni’s men kills a Skraeling as he reaches for Norse weapons. Supernatural events occur: As she waited, Gudrid had seen a strange woman approach with enormous eyes who said she was Gudrid; as the Skraeling was killed the spirit woman disappeared!— The Skraelings return to attack and the Norsemen manage to fight them off. Karlsefni stays the rest of the winter and returns to Greenland in the spring. 7 – Two brothers arrive from Iceland, Helgi and Finnbogi. Freydis Eiriksdottir, the daughter of Eirik, suggests they all travel to Vinland and share the profits fifty-fifty. They agree to have only 30 men on each ship but Freydis double crosses her partners immediately by taking along 5 extra men. The brothers arrive slightly earlier in Vinland and move into Leif’s house but when she arrives, Freydis orders them to leave. Games which are mean to unify the little colony just lead to further disputes. One morning Freydis wakes Finnbogi to talk to him. Returning to her bed she tells her husband, Thorvard, the brothers abused and beat her and says she’ll divorce him unless he avenges her. Thorvard leads his men in tying up all the men from the other camp while they are still sleeping. Freydis has each man killed on the spot until only the five women remain who her crew are reluctant to kill. She asks for an axe and kills them all. She is greatest psychopath in all the sagas I’ve read. Freydis threatens her crew with death if anyone tells these deeds. They load the ships with goods and sail back to Greenland, telling everyone the brothers chose to stay in Vinland. 8 – Eventually Leif learns the truth and is horrified but doesn’t take it upon himself to punish her crimes. Meanwhile the saga returns to Gudrid and Karlsefni who make land in Norway, trade, then return to settle in north Iceland. When Karlsefni dies their son Snorri takes over running the farm while Gudrid goes on pilgrimage to Rome and returns to become a nun and anchoress. Their descendants include notable bishops of Iceland. The murderess balances the holy woman – but both are treated with that same flat affect so characteristic of the sagas, so heartless and yet compelling. There is no false sentiment. There is no sentiment at all. Thank you for this. Very useful for my Ancient / Medieval Cultures class as this is one of very few summaries for this story on the internet.